Do you love The Libertarian Republic news magazine, but are annoyed by all the pop-ups and advertising? We hear you. We’re a very small startup, with even smaller budgets, so we need advertising in order to keep in business. However, we have come up with a solution for those who love the site, and are willing to pay a small subscription fee in order to read the site without the ads. You can choose a monthly option, or a yearly subscription with a small discount. You can cancel at anytime. UPDATE: Great news! We just added a new feature for subscribers. 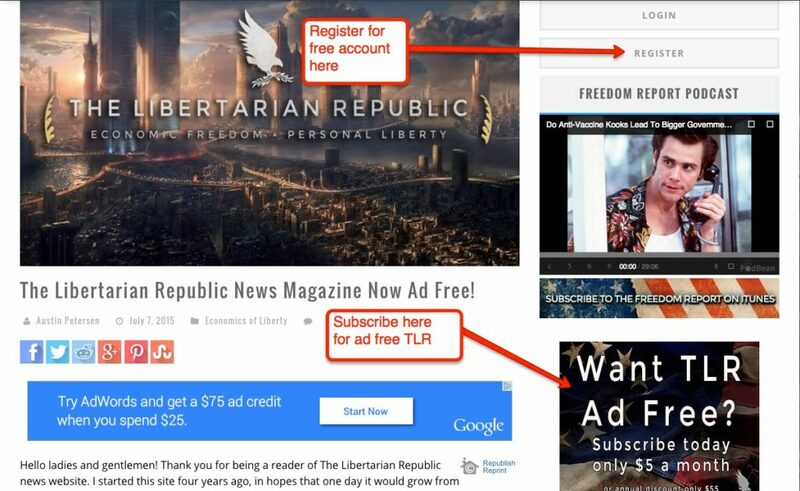 All of our liberty listicles will now appear on one page for our subscribers. Note, you must be signed in to your account in order for this function to operate. Please note, in order for you to be able to receive a subscription, you must have a free membership that you registered on TLR already. The easiest way to do that is to either sign up for a free account by clicking “Register” on the top right hand of the page, or if you are on mobile, scroll down until you see the widget which says “Log In,” and then click on “register” to receive your free account. You must have a free account before you can register for a subscription. Then, once you are a paying member, as long as you stay signed in on your desktop or mobile device, you will no longer receive popups and advertisements. We have attached a screenshot below to help explain. Thank you and we hope you continue to enjoy TLR!